I gave up coffee… HELP!!! I’m writing this in the hope that there are others out there like me who can share their stories and support. I’ve been on and off with coffee. I’ve been a coffee snob to a coffee whore to a coffee hater who got my kick out of peppermint tea instead (*sigh* those were the days). Enough is enough. It seems like every time I allow this substance back into my life it plays with my health, and I’m TIRED of it! I noticed that after I drank a coffee I very quickly felt weak and depleted, I had dark circles under my eyes and all the colour disappeared from my face and from my inner eyelids. No matter how nutritious and delicious the food I was eating, I would ruin it by drinking coffee afterwards, dehydrating me and making me bloated, burpy, and a bit nauseous. I could see and feel that this wasn’t good for me, but just to quench any doubts I took a look at this and well, I can’t lie to myself any longer. One small cup seamlessly evolves into two, then three, then into a toffee-nut-gingerbread-caramel-shaped-disaster. It pisses me off in so many ways: why must we be adrenalised all the time? Why must it be so acidic? 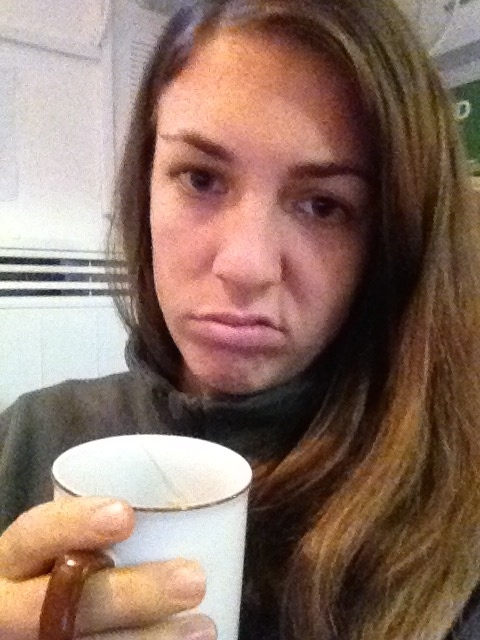 Why are there all these beautiful, trendy, irresistible coffee shops with no herbal tea options anywhere?? Why are there so many milkshake-like varieties?! It’s like after I drink it the world is beautiful for 20 minutes and I feel great until it brings out everything that’s bad in me for the next 3 hours…I want to nourish myself not starve myself of proper nutrient absorption and hydration – why am I drinking this stuff?! My yoga practice has taught me to keep it real. It’s taught me to listen to my body. It’s taught me that my body will thrive under a natural rhythm. I want to thrive. I’m giving this a good shot for 2 weeks. Any advice would be much appreciated! Next Give The Yogi Gift This Xmas: Make Vegan Chocolate! Good luck! I don’t think I could do it 😦 I honestly think its more of a comfort thing for me. I pour one cut every morning at work and sip on it, and at the end of the day end up pouring half of it down the drain. Thank you! I know what you mean about the comfort thing – I think we’ve been conditioned to associate it with goodness. Also I think the smell is way more delicious than the taste. Hmmm…Maybe I could just have a sniff… Just one! Sounds like you can control yourself if you’re able to have just one for the whole day, and not even finish it – bravo!